Let me start by thanking the Director General, Mr. Yukiya Amano, for his report under the agenda item 6 (d) “Implementation of the NPT safeguards agreement and relevant provisions of the United Nations Security Council Resolutions in the Islamic Republic of Iran”, as contained in document GOV/2015/15. We welcome the continued cooperation between the Agency and our brotherly nation the Islamic Republic of Iran, including the latest meeting that took place between Director General Amano and authorities of the IR of Iran, where it was agreed to continue dialogue with a view to resolving all outstanding issues related to Iran’s nuclear programme. Afghanistan underscores the inalienable right of all states for access and use of nuclear technology for peaceful purposes, reiterates its traditional position and expresses its strong support for the establishment of a nuclear-weapons-free-zone (NWFZ) in the Middle East, as well as all other steps aimed at elimination of all weapons of mass destruction and global nuclear disarmament. Afghanistan supports the Agency’s continued efforts to undertake monitoring and verification of the Joint Statement on the Framework for Cooperation and of the Joint Plan of Action, and commends all parties involved in the ongoing negotiation process; we are positive that with continued political and diplomatic means from all sides a sustainable compromise can be reached. Afghanistan welcomes the achieved progress and remains hopeful that all outstanding issues, past and present, can be solved in the foreseen timeframe, which is essential to fully restore international confidence toward the exclusively peaceful nature of Iran’s nuclear programme. We encourage all IAEA Member States to contribute positively to diplomacy and dialogue on this and all other matters important for all of us. Let me also take this opportunity to welcome the application of Turkmenistan for membership of the IAEA. We look forward to welcome our sisters and brothers from Turkmenistan to the IAEA family, and we will closely cooperate with Turkmenistan in the spirit of our excellent neighborly relations. Ambassador Erfani addressed the organisers and Afghan delegation in Vienna for the IAEA National Experts Meeting to Design and Formulate Technical Cooperation National Projects of Afghanistan for 2016-2017, at the VIC today. The meetings were held from 2-6 February and it was a great opportunity for the delegates to discuss furthering technical cooperation in Afghanistan. 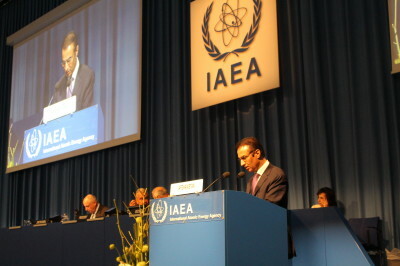 Ambassador Erfani addressed the closing session noting the important achievements Afghanistan has made for the past decade, such as the establishment of the Independent Nuclear Energy Commission and how far Afghanistan has come in terms of capacity building in the country, with the assistance of the IAEA, especially in the areas of safety, agricultures and human health. He mentioned that Afghanistan’s priority of strengthening the quality control of X-Ray equipment; radiological monitoring; energy planning; using atomic energy in water, soil and crop improvement; and the Aliabad teaching hospital telemedicine program, among others, are all of great importance as we moved towards improved capabilities and capacities in the country. We appreciate the active cooperation and partnership of the IAEA with Afghanistan in these fields. Additionally, this week Ambassador Erfani was kept busy with a number of pressing issues: He met with academic Ms. Edit Schlaffer (Women without Borders, Sisters against Violent Extremism) to discuss empowerment of women in Afghanistan, making reference to the successful women’s employment project in Kunduz. They discussed her organisations and possibilities for cooperation with Afghanistan in the future; and the OSCE’s engagement with Afghanistan and neighbouring countries. On Tuesday Ambassador Erfani met with Ambassador Launsky, head of the Austrian Foreign Ministry’s Department of Development Cooperation to discuss Austria’s furture possible involvement for development projects in Afghanistan and they also discussed including the issues related to the Kunduz project on womens empowerment. On Wednesday, Ambassador Erfani attended a brainstorming session at the OSCE to prepare for a Security Days discussion on how the OSCE could enhance its efforts to promote tolerance and non-discrimination, as one way to help to prevent the growing challenge of religious related violence in the OSCE region and expressed Afghanistan’s position. Ambassador Erfani noted the importance of the sensitisation of all people to religious diversity and promotion of tolerance and respect for all people. At the meeting he condemned the brutal killing of the Jordanian pilot this week at the hands of extremists. On Friday, Ambassador Erfani met with the head of the UNODC Terrorism Prevention Branch (TPB) and his team, to discuss UNODC projects in Afghanistan and how the UNODC can be more actively implement these projects in the country. They exchanged views on the future of cooperation and the mandate of the UNODC and Afghanistan’s National Priority Programs. He thanked the UNODC’s continued participation in Afghanistan’s stabilisation process. Firstly, allow me to congratulate you, Mr. Chairman, on your able guidance of this session and I assure you of my delegation’s full support for a successful outcome. We align ourselves with the statements made by the Non-Aligned Movement and the Group of 77 and China, and would like to make a few brief remarks in our national capacity. We commend the Co-chairs of the Working Group, the distinguished Ambassadors of France and Kenya, for their effort to prepare the timely repot on Financing the Agency’s Activities (WGFAA). We highly value the role of the IAEA in promoting development of the peaceful and responsible applications of nuclear technology. We encourage the Agency to further enhance its role in attaining the Millennium Development Goals and in the Sustainable Development Goals framework. Afghanistan appreciates the efficient and effective management of TC activities and encourages enhanced usage of updated Results-based Management techniques. Accountability and transparency are vital for the successful implementation of TC activities and we would like to advocate for greater participation of LDCs in the Agency’s TC programmes. We would also like to highlight the importance of proper assessment of national requirements, while fostering cross-border and regional cooperation activities, also in cooperation with other international and regional organizations. We are aware of the fact that many donor countries are facing challenging times in terms of budget constraints, yet we would like to recall the importance of timely payments. Afghanistan is committed to implement its TC projects. Finally, let me express once again our appreciation for the technical cooperation activities of the IAEA, in particular the excellent work of Asia Pacific Division with Afghanistan, and we remain dedicated to our excellent cooperation with the Agency’s Secretariat. Statement by H.E. Ambassador Ayoob Erfani, Permanent Representative to the IAEA and Head of the Delegation of Afghanistan, at the IAEA’s International Conference on Nuclear Security: Enhancing Global Efforts. At the outset I would like to congratulate you Mr. President, for assuming the chairmanship of this Ministerial Conference and assure you of my delegation’s full support for a successful outcome of this session. I wish to extend my appreciation to the IAEA Director General H.E. Yukiya Amano and his team for organizing this first International Conference for enhancing global efforts on Nuclear Security. Furthermore, let me commend the hard work of our two dear colleagues and their team for coordinating the preparatory process of this Conference, Ambassador Balázs Csuday of Hungary and Ambassador Laércio Antonio Vinhas of the Federative Republic of Brazil. After decade of International Community’s joint efforts to combat terrorism, Afghanistan, as a frontline fighter against, and prime victim of this menace, believes that terrorism remains a challenge and that possible terrorist activities utilizing nuclear and radiological technologies constitute a major threat and causes growing concern. The terrorist elements will not stop their crimes against humanity, including the use of weapon of mass destruction, if they were to acquire these weapons. Afghanistan attaches particular importance to a multilateral approach, with the central supporting and facilitating role of the IAEA toward all matters concerning nuclear security, with a view to reinforcing security of nuclear sites around the globe and to invigorating national security regimes in order to prevent illicit acquisition of nuclear and other radioactive material. The Government of Afghanistan welcomes the progress that has been made in recent years in this regard, including the implementation of international instruments. Nonetheless, we are still facing a number of tremendous challenges that urgently need to be addressed, including physical protection of facilities, material, and means of transportation. Therefore, we consider this first ministerial segment, in the wake of Washington and Seoul Summits and on the eve of next year’s summit in The Hague, as a very timely initiative to build on the progress achieved, study the remaining challenges, and make specific recommendations to enhance the international cooperation on nuclear safety and security. These efforts remain vital for the peace, security and stability of all nations. Afghanistan expects that the Nuclear Security Plan for 2014 to 2017 will comprise a broad spectrum of robust norms and practices to secure nuclear materials. The IAEA shall play a major role in setting security standards and developing an international framework for nuclear security. We would also like to encourage the allocation of larger resources for the Agency’s Nuclear Security Fund and increased coordination between the IAEA and the United Nations and Interpol’s Nuclear Terrorism Prevention Unit, while avoiding overlap and duplication. Afghanistan has taken specific measures at the national, regional and international levels to be an active part of International Community against terrorism, including the IAEA’s activities on the areas of nuclear security framework. Afghanistan has joined all regional and international protocols, conventions and instruments against intentional terrorism, implementing relevant UNSC resolutions in this regard as well as the UN Global Counter Terrorism Strategy. The Government of Afghanistan calls upon all countries, and specifically those in our region, to join and implement all anti-terrorism international instruments, to maintain the most effective, meticulous security of all nuclear material under their control. All disposable measures must be taken to prevent terrorists from acquiring nuclear and radiological weapons. We recognize the ongoing work of the IAEA to assist all efforts to implement national nuclear security regimes and encourage all States to make use of such assistance offered. Afghanistan also wishes to emphasize the importance of aligning nuclear security and safety measures, in order to establish a holistic approach, in due consideration of the growing threat of cyber-attacks, towards protection of human health and the environment. Each State has the responsibility to ensure that an effective national nuclear security regime is in place, and that rapid and effective incident response is guaranteed. Operators and response forces must make sure that their mechanisms work as intended. In order to achieve sustained momentum to reinforce nuclear security, we must create a clear and consistent framework of structured agreements, mechanisms, guidelines and best practices. 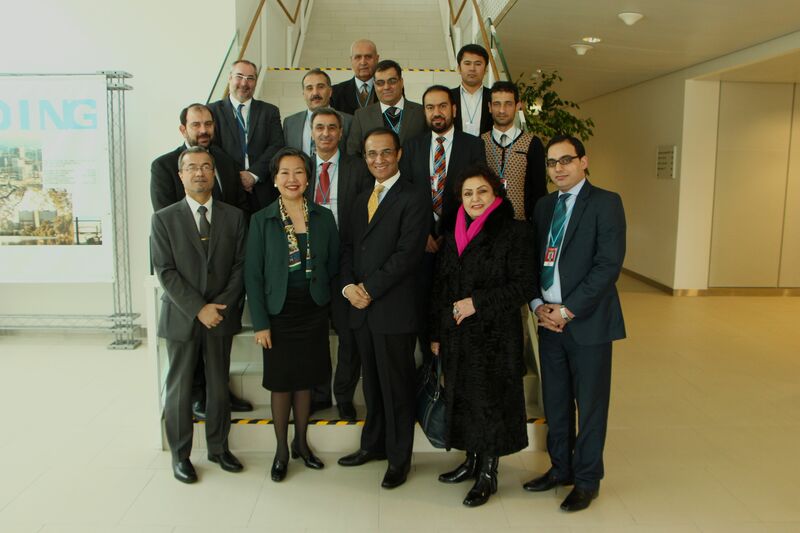 Afghanistan supports all activities aimed at the promotion of confidence among IAEA Member States. Afghanistan has not developed a nuclear power industry, yet derives considerable benefits from its IAEA membership. In recent years, officials from the Afghan Atomic Energy High Commission (AAEHC) and other government bodies including the Ministries of Agriculture, Public Health, Water and Energy, Mines as well as the National Environmental Protection Authority (NEPA) and the Academy of Sciences, participated in consultation and technical meetings hosted by the Agency. Afghanistan, from its daily experience as a Landlocked, Least Developed Country and War Stricken country, remains confident that with enhanced technical assistance provided by the IAEA, we shall be able to build our necessary capacity and attain full implementation of our prioritized technical cooperation programmes. We must ensure that nuclear and radiological technologies both satisfy our needs and meet the highest safety and security standards. Afghanistan has adopted national laws, established national institutions, created law informant agencies/units and still needs technology and technical assistance to build its capacities in the field of nuclear security infrastructure. The IAEA trains personnel from our regulatory authority, assists with development and implementation of revised legislation, regulations and guidelines, accession to international legal instruments, adoption of codes of good practice, a system of authorization, review and assessment, as well as inspection for facilities and activities using ionizing radiation. Afghanistan strongly believes that effective nuclear security regimes also require, enhanced regional and international cooperation, including sharing of information and know-how and technology transfer. In conclusion Mr. President, I would like to reiterate Afghanistan’s strong commitment to be an active part of international community’s joint efforts in the field of nuclear safety and security for the cause of a more peaceful and stable world.